That prompted the other cell members to move up the timing of their plans and to improvise attacks over the next two days that would amount to the deadliest attack in Spain since the 2004 bombings in Madrid. 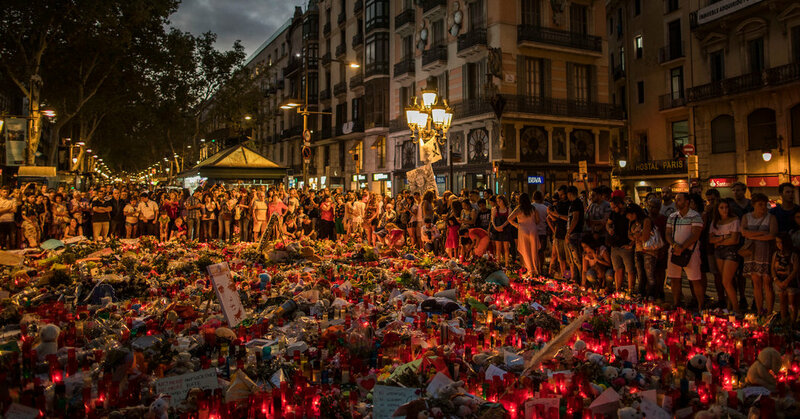 The assailants used a van to crush pedestrians along the popular Las Ramblas boulevard in Barcelona and nine hours later, they used another car to careen into tourists on a promenade in the seaside town of Cambrils. Inside the bombed-out ruins of the group’s explosives factory, investigators recovered 500 liters, or about 110 gallons, of acetone, a solvent used in cleaning supplies, and 340 liters of hydrogen peroxide, a bleach commonly used in hair salons. The two chemicals are the raw ingredients used to make triacetone triperoxide, or TATP, which has become the signature explosive used by the Islamic State in attacks in Europe. Investigators estimate that the terrorist cell had enough precursor chemicals to make 200 to 250 kilograms, or 440 to 550 pounds, of TATP, according to the study. Emergency team members collected evidence at the abandoned home in Alcanar, Spain, that the terrorist cell had been using to make explosives. By comparison, the suitcase bombs that killed 32 people at the Brussels airport in March 2016 and injured more than 320 had each weighed less than 20 kilograms. And the fighters dispatched from Syria to reign terror on the French capital in November 2015, killing 130 and wounding more than 600, had at most a few pounds of TATP in each of their respective suicide belts. The Barcelona cell bought most of the ingredients for its homemade bombs on Aug. 1, 2 and 16, the study found. The two vans used in the attacks were rented on Aug. 16 for seven days, suggesting that the group planned to commit the attack that week. In the rubble of the property in Alcanar, investigators recovered a notebook inscribed with the name of Abdelbaki Es Satty, the oldest member of the cell and its presumed ringleader and recruiter. In a sheet inside the notebook, they found a handwritten note in Arabic describing the cell members as “soldiers of the Islamic State in the land of al-Andalus,” the term the militant group uses to refer to the Iberian Peninsula. Within hours of the first attack, and again after the second, Islamic State’s news agency, Amaq, claimed credit, describing the attackers as “soldiers of the Islamic State.” The claim was repeated and amplified in numerous other ISIS media outlets, including their online magazine. No concrete evidence has emerged showing that the members of the cell were being coached from afar by Islamic State operatives, as has been the case in several other European attacks. However, investigators are still trying to make sense of the trips made by members of the cell, including four pairs of brothers, all of whom were in their 20s or younger, in the months before the attack. For example, Younes Abouyaaqoub, who drove the van in the attack at Las Ramblas, visited France at least three times from July to December 2016, and again on Aug. 11 and 12, 2017, just days before the attack. In his last trip to Paris, he stayed at a hotel in Malakoff, located just six kilometers, or nearly four miles, from the Paris suburb of Villejuif, where on Sept. 6 the French authorities discovered a TATP lab run by men who had been making phone calls to Syria, say the researchers. Two other members of the Barcelona cell made an unexplained trip to Zurich in December 2016, and approximately a week before the attack, another member of the group, Driss Oukabir, made a nine-day trip to Morocco. When questioned, his relatives said they had found it odd that he did not stop by to see his father. In addition to the footage of the Eiffel Tower, a cellphone used by a member of the cell included searches on Google Maps for several locations in Spain, including the Sagrada Familia church in Barcelona and the Camp Nou soccer stadium, suggesting that these monuments might also have been targets. Spanish officials told their French counterparts that they had recovered the footage of the Eiffel Tower soon after the Barcelona attack last fall. According to the researchers, the French government determined that the cell may have intended to strike Paris, too, where the city recently decided to install a glass fence around the Eiffel Tower, in an effort to protect the landmark from small-arms and vehicular attacks.